My husband cooks one thing – burgers. And I happily let him because they’re that good. In fact, people come from miles away to eat his burgers. I didn’t grow up eating burgers and I’ve never cooked them myself. Even though I was born and raised in the U.S., I don’t crave hamburgers and fries like most. But when it comes to my husband’s burgers, I’m first in line. We planned to have them on Memorial Day recently. Then I got the brilliant idea to document what he does in order to share his recipe. He said he didn’t mind if I followed him around with my camera, but that “there’s really no recipe.” But there is. Before the burger-making process begins, he adds hot water to a 32-ounce cup filled with hickory chips. The ground beef he uses is grass fed, 80% lean, 20% fat. He makes the burgers all 8 ounces each, and 1″ thick. The patties are formed by gently pressing the meat into shape. He presses a “well” on the tops of the patties. A generous amount of Worcestershire sauce and coarsely ground pepper are added. Let them sit at room temperature until it’s time to begin grilling. Then he starts the fire. He will only use charcoal for grilling, and he’s patient with the fire. Neither of us like “charred” or “flame-kissed” burgers. Only after all of the charcoal is grey, after about 45 minutes, he spreads out the coals and sprinkles on the soaked hickory. The patties are placed on the grill carefully and cooked for 7 1/2 minutes on that side. The lid is propped open so that the fire doesn’t get too hot, yet the hickory smoke stays inside the grill. After the burgers are turned over, more Worcestershire sauce and pepper are added. After another 7 1/2 minutes, the burgers are ready to eat. I like mine with lettuce, tomato, onion, cheese, ketchup and yellow mustard, but they would be fantastic any which way! So, I don’t really know what makes these burgers so delicious. I think the hickory smoke is part of it, the Worcestershire sauce and pepper are part of it, using real charcoal, plus cooking only to medium-rare is also part of what makes these so good. That is a very good looking burger! I love the fact that they are not cooked to death as most meat is in the US. I know. Everyone who has come in to our family has learned to love medium-rare beef!!! And trust me, he does nothing else in the kitchen except pour wine! Interesting! So no salt at all apart from that given by the Worcestershire… I also love a medium rare burger, perfection! Right. The W. sauce is really salty, as I’m sure you know. I love certain things salty, like popcorn, tomatoes, cukes, but I don’t add salt to these burgers! I agree about the seasoning. Besides, the W. sauce “marinade” really adds flavor! If you are first in line I’m 2nd. Wow, those burgers look awesome. Your husband knows his burgers. Love how carefully they are made and the tutorial is terrific. 4th of July this is how I will make them. I rarely eat hamburgers but I do love a good burger from time to time. such a great idea to use hickory chips when cooking burgers, we have only done that with fish. this burger looks perfectly cooked, I can see why it is such a treat for him to bbq. Sometimes I have thought that he shouldn’t bother, but I really think that’s part of what makes them so fabulous! Yes, Mimi, Yes!! LOVE a good rare to med-rare burger especially when it’s grass feed beef. I love a good burger and this one looks amazing! These burgers look great, Mimi! I am not a burger person either, but looks like I would love these. I think that besides the hickory smoke/charcoal and medium rare that you already mention, it is also important that the burgers themselves contain nothing but beef, and not too lean. No breadcrumbs, eggs, or onions to mess up the beef flavor. P.S. Looks like briquettes instead of charcoal in the photo. Briquettes burn longer but not as hot as charcoal, and seem preferable for this recipe as you’re cooking them 7.5 minutes per side. With real charcoal, they would burn when cooked for that long. Both briquettes and charcoal are better than gas! Good to know. I wonder how I could get my hands on real charcoal? I’ve looked into it and apparently it is called “lump charcoal” in the US. Unlike briquettes, lump charcoal has irregular shapes (instead of all briquettes having the same shape and size) and is made of pure wood without additives. It is easy to recognize if you look in the bag. If you can’t find it in the store where you’d normally shop for the briquettes, you could order it online. 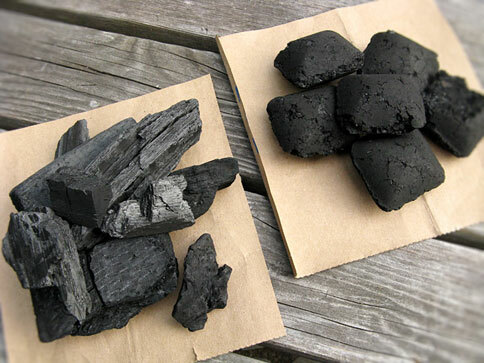 This photo shows lump charcoal on the left-hand side and briquettes on the right-hand side. Thank you. This is very interesting. And I had no idea that the briquettes aren’t charcoal. That is probably because they are called “charcoal briquettes” in the US, and do contain charcoal. I don’t know if it’s just that my mother never made them or what. I was born and raised in the US, but I am just not enamored with burgers like most Americans. okay, sorry, but what’s a joe’s cup?!! Sorry….Eskimo Joe’s…..or Hideaway….or any pub anymore…..trying this burger tonight! Does your husband only cook one thing too?!! Simply gorgeous! When I read step one, soak hickory chips, I was sold. How generous to share this recipe. I agree with real charcoal all the way and being patient while the fire reaches perfection. Really impressed by the simplicity of the recipe, yet it’s unique and has beautiful flavours…goes to prove that sometimes less is more! I agree! Love the hickory, the charcoal, and the simplicity of the recipe! hmm. I understand everything but the pineapple? well I should try it before I judge! I wish your husband would make my burgers. Truth is, I don’t eat burgers anymore, but these may make me rethink that! Now I will forward this on to my husband! They’ve just never appealed to me, and I would never get them at a restaurant! We like ours cooked medium rare too, and yes on the Worcesershire! Along with Mrs. Dash Garlic and Herb. Sometimes we use mesquite or hickory charcoal lumps that Stefan showed you, but it’s usually just propane (at home) and regular charcoal (at our coastal RV property). Thanks for sharing Mimi!!! Oh dang, sorry spell check Kathryn! Worcestershire, lol! I thought you were being British! Those burgers are done to a turn… with the July 4 weekend looming, they look like just the ticket. They would be a great 4th feast! I don’t know what to say. I guess you must trust your sources for meats! My husband is the grillmeister in my family and does not like being told what to do. He uses a gas grill. I love the looks of your hamburger and the idea of adding Worcester sauce. I too love having a husband with skills in the kitchen that I don’t share – mine makes sauerkraut and yoghurt and he would go crazy for these burgers. Thanks Chef Mimi! Sauerkraut and yogurt! Nice! Definitely have him try these burgers! I love Worcestershire sauce in my burgers. The hickory smoke is brilliant. I’ll have to try that some time. It certainly seems to work! Now that’s how you make a great burger. I think you’re right – combination of the hickory smoke, real charcoal, and the Worcestershire sauce. I think the only thing I would add is a slice of bread and butter pickle on top. I’ve been told that briquettes aren’t the same as pure charcoal, but I call it charcoal. I love the idea of the hickory. Clever man! That does look like one amazing burger! We don’t use charcoal any longer, so I hope this can translate, in some way, to a gas grill. I’m sure it does, but I would have no idea. I’m not allowed to own and use one. But we both dislike “burnt” burgers, and I know he really lets the heat die down before even putting on the burgers. This is a good looking burger! I’m medium rare all the way too. Your husband has got this down perfectly! At least he cooks something!!! Gorgeous, simply gorgeous. I never knew about the worcestershire sauce! I have actually never used it on anything else. It just is in the fridge waiting for burger time! I don’t guess I’m enamored with burgers but I love a good burger. I don’t eat burgers out alot because they don’t taste the same. My dad was a butcher so he didn’t feel a good cut of beef needed much seasoning except salt and pepper. If he used anything else it would be worcestershire sauce. What is it with men and grilling, I wonder? I also let my husband handle burgers. And steaks. Mine overlooks everything but burgers. So he stays away from everything but the burgers!